I designed this attractive scarf for a little boy who plays with my granddaughter. 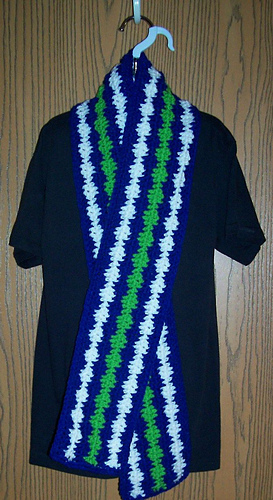 The colors I used are a bit masculine to suit him, but you can make yours in any color combination. The length and width is also perfect for a child, but you can make yours in any length and width of your choosing. It’s an easy pattern repeat to work, even for a beginner. The fact that it’s worked lengthwise, along with the color changes, makes it go really fast. I started and finished this one while watching a movie on TV. And it probably only took me the whole 2 hours because I kept stopping to pay closer attention to the movie!